Looking for a dating site for the Deaf and HOH community? Whether you are deaf, HOH, read lips, know ASL, know BSL or you are studying to be an interpreter, Deaf Online Dating is one of the better sites to choose from, with photos, webcam features and much more! Join for free to see what you think! If you are looking to meet deaf and hearing impaired singles in your local area, then you should definitely check out 'Meet Deaf Singles'. It only takes a minute or two to set up a free account so you can check out the site to see what you think. Niche dating has exploded online, providing sites that are exclusively focused on one particular group of people (and the people who are interested in that group). If you are interested in the Deaf community, Deaf Dating Connexion is the site for you. It only takes minutes to create a free account, and then you are free to check out the singles who have also been drawn to this site. You can't meet someone just by looking at the homepage, so join...and start having fun! "Free Deaf singles, dating and friendship community with photos, text & video chat, message boards and more." If you are looking for other deaf men and women interested in dating, you shouldn't overlook Deafs. 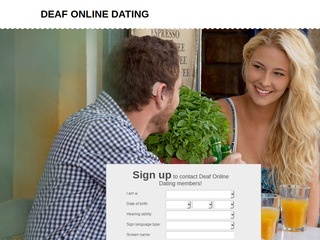 The key to a site working is to have a large active memberbase, and as a member of one of the largest online dating networks, Deafs is designed specifically for deaf and hard of hearing members. Deaf Rave - Good Bass. Good Vibrations. Good Times. "Organised By Deaf People For Deaf People." Deaf Rave plans raves for the deaf community. "DeafMail is UK non-profit making, email-orientated deaf consumer organisation and social club. In the friendly, social atmosphere within DeafMail, the members help and support each other, supply and exchange information, discuss any issues and subjects of interest or just have a chat." ASL Singles - The Way Signing Singles Meet! ASLSingles.com is an online dating site for members of the American Sign Language Community. Register for free now.